Creative director of boutique dessert and styling brand Nectar and Stone, Caroline Khoo, talks her first cookbook, her love of pink and kitchen failures. 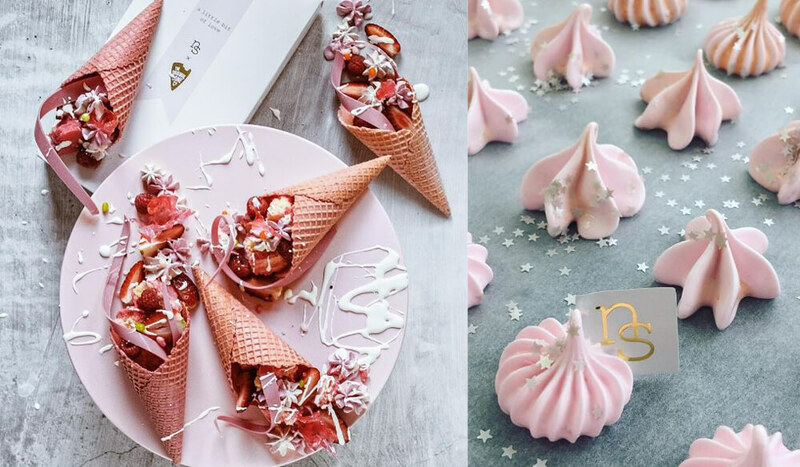 Creative director of boutique dessert and styling brand Nectr and Stone, Caroline Khoo, talks her first cookbook, her love of pink and kitchen failures. Your first book I’m Just Here for Dessert has hit bookstores. Tell us about your inspiration? I’m Just Here for Dessert was inspired by my surroundings, past and present experiences, things that I love and what I have learnt. It is a journey in which I build layers, adding to the experience for the reader. You have 386k followers on Instagram. Why do you think people love seeing your sweets? It’s a visual overload – we eat with our eyes first. I think my community have come to know and understand me; they appreciate the quality of the photography, styling, concept and ideas that come to life in the form of sweets. Anyone who follows you on Instagram will be familiar with your pretty pink edible creations. Have you always been deeply into pink? No, I was never fond of pink until I started Nectar and Stone. When I had my two sons, I felt everything around me was masculine, and I was searching for something delicate and feminine. Nectar and Stone seemed to take on my expression of all things pretty and femme; hence the reason why I think pink is so prominent in my work. You’ve collaborated with some pretty incredible brands such as Dior, Tiffany & Co and Christian Louboutin. Is there an Australian label that you’d love to collaborate with? Yes, these brands are amazing. I have been very fortunate to have worked with some great Australian brands, too, like Mimco and Samantha Wills. There are so many labels I’d love to work with, like Camilla and Marc. Your dessert creations sit on the border between food and art. Do you ever find people reluctant to eat them? I love that people find the desserts pretty. They are never reluctant to eat the desserts – they just take a photo first. What came first, a love of baking or a love of styling – and why? A love of styling. I have always been a very visual person, so this definitely came first. The styling element also allows me to develop ideas and concepts, which I transfer onto my baking. Do you have any words of wisdom for your former self as you were embarking on Nectar and Stone? I use the word ‘filter’ a lot now. Filter what advice is given, filter comments, filter the good energy. We need to use our filter more. How would you describe Nectar and Stone to someone who isn’t aware of it? Nectar and Stone takes you on a journey of concept dessert design and breathes layers of soft delicate expression, feminine details and originality. Have you ever turned up just for the desserts? Are you a sweets-over-savoury person? [laughs] Truth be told, yes. There have been many times, whether at family celebrations, events or even restaurants, that I request dessert for my meal. I am a savoury person too, though, and often crave Asian food such as dumplings. I love soy sauce. Have you ever had any spectacular failures you can tell us about?